Steve Jobs, 56, died today. May his soul rest in peace. 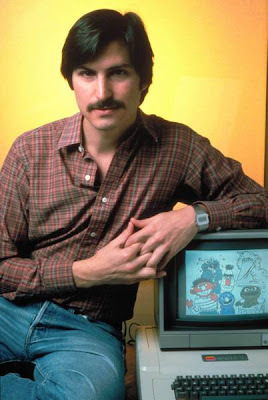 People know a lot about the brilliance of Steve Jobs, but what is generally not known is that the rare creative genius who revolutionized several major industries was the son of a Syrian Muslim, according to ABC. Jobs was born to Abdulfattah Jandali and Joanne Schieble in 1955 when they were both students at University of Wisconsin at Madison. After birth, Schieble was separated from Jandalli and forced to put Steve up for adoption by her parents. Jandalli, 80, now works as a vice-president at a casino in Reno, Nev. Prior to his current job, Jandalli was a professor of political science. Jandalli also has a daughter Mona Simpson who is a novelist and a professor at University of California in Los Angeles (UCLA). Jandalli never met his biological son Steve Jobs since he was adopted by Paul and Clara Jobs. Paul Reinhold Jobs was a a high-school drop-out who worked as a machinist. Paul was born November 27, 1922 in Wisconsin, and died on died March 5, 1993. Steve's adoptive mother Clara Hagopian Jobs was born August 23, 1924 in New Jersey. She died November 7, 1986. Steve's adoptive parents lived at 2066 Crist Drive, Los Altos, CA where Apple was born on April 1, 1976 in the garage. And the rest is history. "Remembering that I'll be dead soon is the most important tool I've ever encountered to help me make the big choices in life, Because almost everything - all external expectations, all pride, all fear of embarrassment or failure - these things just fall away in the face of death, leaving only what is truly important." Riaz: Thanks for the info. Well, I don't know if it should be celebrated or lamented. After Obama this is another jolt. Talk about the pain that can languish some lives. We should be thankful for having our kids and raising them too. I really hope you are wrong. But know that you are not. Steeve jobs was officially a buddhist! didn't lift a finger when the kid needed him the most and now that he is famous wants him to 'reach out'! PS this is also true for other hypocrites like pt ravi shankar who felt 'hurt' that norah jones didn't recognize him at the oscars! "No one wants to die. Even people who want to go to heaven don't want to die to get there. And yet death is the destination we all share. No one has ever escaped it. And that is as it should be, because Death is very likely the single best invention of Life. It is Life's change agent. It clears out the old to make way for the new. Right now the new is you, but someday not too long from now, you will gradually become the old and be cleared away." -Steve Jobs, 1955-2011. In the same Stanford speech, Jobs also told graduating student to "Stay hungry, stay foolish". >this fact with everyone even after finding his ways to the riches. >their entire nest egg for his tuition. >inventiveness all together at once. >what you truly want to become…………..EVERYTHING ELSE IS SECONDARY!! >The above luges me, I don't know about you!!?? Born to a muslim father and a christian mother and brought by a christian couple without knowing anything about the biological parents, want to learn the eastern mystism and finally lived and died as a buddhist is story of Steve. I hate apple as it is too restrict but i love steves spirit. the convocation address of steve, where he has expressed the bitter truths of his life which many would like to hide very easily behind wealth and success. He is a true example of following once nature without the fear of the consequence of result of action. Abdulfattah “John” Jandali is a casino manager outside Reno, so he knows about odds. And he must wonder sometimes: What are the odds of a Sunni Muslim immigrant from Syria producing two dazzling American talents, a son who transformed the world of technology and a daughter who lit up the world of literature, and ending up estranged from both? Of the many memorable photos that have been published since Steve Jobs died, the most poignant was in The Wall Street Journal on Monday. The picture itself wasn’t anything special, not like the intimate portraits of Jobs by Diana Walker that appeared in Time magazine. This was just a head shot of Jobs staring out, with rimless glasses, aquiline nose, receding hairline and intense brown eyes. It mesmerized because of its juxtaposition to a head shot of Jandali, Jobs’s 80-year-old biological father, who stared out with the same rimless glasses, aquiline nose, receding hairline and intense brown eyes. Jandali told The Journal that, over the last year, he periodically sent some e-mails to the son he never met, wishing him happy birthday or better health. He said he got a couple of short replies, including a “Thank you.” But a Jobs family friend disputes that. Jandali, a widower, reads books on an iPad and uses an iPhone 4. But the father of Jobs never met the father of Apple. The closest he got was downloading videos of Jobs introducing Apple products. He didn’t even learn Jobs was his son until around 2005. When Jandali was pursuing his doctorate in political science at the University of Wisconsin in the early ’50s, he fell in love with a fellow graduate student named Joanne Schieble. She became pregnant, but her family did not approve of her relationship with a Syrian, so she put up her son for adoption. The boy was raised by Paul Jobs, a high-school dropout and machinist for a laser company in Los Altos, Calif., and Clara Jobs, an accountant. Once Joanne’s disapproving father died a couple of years later, she married Jandali. They had a daughter, who grew up to be Mona Simpson, the novelist. The couple divorced after a few years and Joanne and Mona lived in Green Bay, Wis., feeling as though Jandali had abdicated his role in their lives. Jandali told The Journal that he had tried to reach Mona after he heard of Jobs’s death, but she did not respond. He keeps a publicity shot of his daughter that he downloaded from the Internet, framed, on his desk. Like Shakespearean drama, where fathers haunt and where siblings are swept apart by a shipwreck only to learn later that the other is still alive, Steve and Mona met only in their mid-20s. Jobs began the hunt for his biological mother in his teens and was ready to give up, he told The Times’s Steve Lohr, when he finally discovered at age 27 that he had a younger sister. He was thrilled that she was an artist because he liked to think of himself as one. The computer whiz kid and the literary whiz kid grew close. Simpson mined the theme of missing fathers for her critically acclaimed novels “Anywhere But Here” and “The Lost Father.” She also wrote a novel inspired by her famous brother, “A Regular Guy,” which casts a gimlet eye on Jobs, who specialized in hot-cold emotional roller-coaster rides. It’s about an emotionally disconnected, fruit-loving Silicon Valley biotech entrepreneur named Tom Owens, “a guy in jeans, barefoot in the boardroom.” He lives in a barely furnished mansion once owned by a copper baron, as Jobs did; he loses control of his company to suits, as Jobs did; he tried to decide whom to marry by asking friends which of his two girlfriends was more beautiful, as Jobs did; he belatedly forms a relationship with his out-of-wedlock daughter, as Jobs did. She focuses on the painful central question about Jobs: How does the abandoned become the abandoner? When he cast off his own infant daughter he was the same age his parents were when they cast off him. Three years after the novel came out in 1996, Lisa Brennan-Jobs, the daughter Jobs had with an old girlfriend, wrote a searing piece for The Harvard Advocate about how it took her two years to get up the courage to read her aunt’s book, which contains details like Jane (Lisa’s doppelganger) forging her father’s signature on her Harvard application. The roman à clef jangled nerves in the family, but Mona and Steve were close again when he was dying. Beyond the gushing encomiums for the Prospero of Palo Alto, there roiled a family tempest that might have even shocked Shakespeare. For those who are so busy trying to denigrate Mr. Jandali and celebrate Steve Jobs. I suggest you take a look at the fact that this was the 50s. Young girls who became pregnant were forced to marry the young boy who got them pregnant. Or she quietly went away to have "it" taken care of (adoption or termination). You judgmental idiots need to grow up. Add to that, the fact that Mr. Jandali is a Syrian Muslim. You think that Joanne's white "middle america" father is happy with that idea? Mr. Jandali married Joanne AFTER her bigot father died. This means he must have loved her, and she loved him. The marriage did not work. Many marriages do not work. Place a little blame with Steve's bigoted biological maternal grandfather. I notice Joanne's father is conveniently absolved of any blame on this blog. Blame Mr. and Mrs. Jandali for not seeking their son when he reached 21. But Mr. Jandali has stated that he did not make the choice, Joanne did. Blame Steve Jobs for NOT claiming his on child and leaving his "baby mama" and child on welfare for years. Steve Jobs is no angel. He made really cool gadgets. But he is no angel, and he is no martyr. He was what we all are: Flawed and Human.